Portugal may now seem like a small country on the outer edges of the European Union, but in the early decades of European expansion, in the middle of the last millennium, it was the world's first truly global empire. 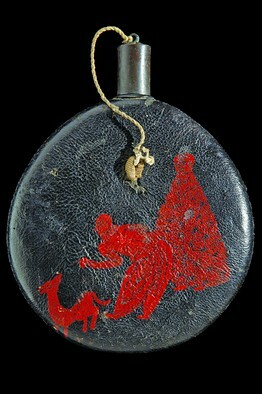 Powder flask from the Momoyama period (circa 1573 to 1603) in Japan. That empire reached a bloody end in the southern African wars of the 1970s, when Portugal's last colonies gained independence, and its remote origin and horrible conclusion have rendered it something of an ignored chapter, even in Portugal itself. However, a new museum in Lisbon, the Museu do Oriente, or Orient Museum, allows visitors to re-examine a key aspect of the empire—Portugal's centuries-long ties to Asia—with contemporary curatorial acumen. By the 1540s, after establishing outposts in India and China, the Portuguese became the first Europeans to make contact with Japan, bringing with them Western guns, Counter-Reformation Christianity and Chinese silks. In return, they took away, among other things, a range of special Japanese handicrafts, known as "Namban," whose very subject matter was often the Portuguese presence in Japan. This winter, the Museu do Oriente looks back on the period in a special exhibition called "Namban Commissions: The Portuguese in Modern Age Japan." "Namban" is translated as "southern barbarians," referring not to Portugal's place in southern Europe, but to the Portuguese point of entry in southern Japan. In 1639, the last Portuguese were finally expelled, but for a century their introduction of European and Asian goods had a profound effect on certain aspects of Japanese life. Presenting some 55 rare objects, assembled largely from Portuguese collections, the exhibition is a blend of what could be called the anthropological and the dramaturgical. We see how everything from gun barrels to sake bottles become de facto canvasses for depicting mutual curiosity and suspicion. The signature work of the show is a breathtaking 4-meter long painted screen, showing a meeting between a Portuguese cortège—made up of soldiers, priests and slaves—and a Japanese delegation, led by black-clothed resident Jesuits. We associate the opening of Japan to the west with Commodore Perry's now mythical arrival in Tokyo Bay some two centuries later, but here is its foreshadowing, with Portuguese galleons instead of American frigates in the background. Many Namban works were made for export to the European market, but one domestic piece, an early 17th-century Japanese military mask probably intended for ceremonial use, shows how the Namban style impacted Japanese taste. Instead of using the head of a mythical bird, which was the common motif, craftsmen gave the mask the strong facial features then associated with the Portuguese—enormous nose, arched eyebrows and a leering smile. This may be the face of a devil, but it is also the direct ancestor of the Walkman, the Toyota and your corner sushi bar.